Promotional KOOZIE® Imprinted Lunch Sack is made from 70-Denier nylon. Custom Lunch Sack features insulated construction. 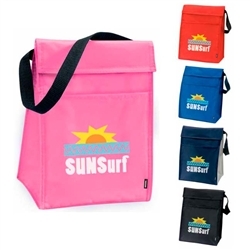 Promotional KOOZIE® Imprinted Lunch Sack is available in 5 colors: Black, Navy/Silver, Pink, Red, and Royal.